Before Saint Spyridon became primarily associated with the island of Kerkyra (Corfu), he was first associated with the island of Cyprus. He was born in the Cypriot village of Assia in Mesaoria, where he was raised by devout Christian parents and earned his living as a shepherd. He himself was a humble and simple man, who lived a pious Christian life. After he married and had children, of whom we only know of a daughter named Irene, his wife died and he was ordained to the priesthood and later was elected Bishop of Trimythous (Tremetousia). Irene died soon after this as well while he was attending the First Ecumenical Synod in Nicaea. His pure and holy way of life allowed him to be sanctified by God's grace, by which he was given the power to work many astonishing miracles, earning him the nickname "Wonderworker". In the mid-fourth century Saint Spyridon departed to the Lord in Trimythous. Even after his death he continued to work many miracles through his incorrupt relic in Trimythous. In the seventh century, however, due to the relocation of Cypriots to the Hellespont, his relic was also brought to the Hellespont. Then due to Arab raids there, it was brought to Constantinople under Emperor Justinian II and placed in the Church of the Holy Apostles. When the City was conquered by the Ottomans in 1453, the priest George Kalochairetis managed to rescue and relocate it, in 1456, to Kerkyra, where it is preserved today and continues to work numerous miracles, and he has become the protector and guardian of the people and island of Kerkyra, who love him as one of their own. Early on the memory of the Saint was celebrated in both the place of his birth and the place of his death on December 12th, the traditional date of his repose, where a strict non-working day was kept to allow the people to honor the Saint by attending the Divine Services. In the village of Tremetousia there is a monastery dedicated to the Saint, and crowds of pilgrims would come there to celebrate his memory, including Turks of the region, who considered him also to be a Saint. One thing is for sure, which is that Saint Spyridon is much beloved by the people of Cyprus, and always has been. This is evidenced by the fact that nearly every church, both new and old, on the island has some sort of image of him. In the Church of the Panagia of Asinou there is even a fresco from the fourteenth century of Saint Spyridon's daughter, Irene. In the villages of Mesaoria several traditions associated with Saint Spyridon are recorded. One tradition has him as a punisher of children for their misdeeds and to correct their misbehavior. With this tradition is that which says he punishes those who do not respect the non-work day of his feast, such as a woman who baked bread on December 12th and saw them turned into stones, for popular piety required that his feast day be respected for the spiritual edification of all through prayer, the study of Holy Scripture and philanthropic acts. There is also the story of the punishment of sacrilegious thieves, who stole eggs that were offered to the Monastery of Saint Spyridon, and they were punished by having yellow teeth like the yoke of an egg. Saint Spyridon is considered by the people to be "without equal", as they call him, particularly for his therapeutic assistance to those who have ear problems. This is why many would go to his monastery in Tremetousia and would place their ear on a hole on his sarcophagus, deeply convinced that the Saint would heal them. They also would say that his shoes were made of iron, because he was always on the move assisting those who needed his help. Oftentimes people would offer shoes to the Saint and place them next to his sarcophagus, and the next day they would find the same shoes worn out, proving that indeed the Saint constantly runs to those who invoke him with faith. This contributed to the people resorting to him in times of drought, since this was a survival problem in the olden days in Cyprus. They would then tie a thread around the katholikon (main church) of his monastery and seek his help, knowing that in his life it is recorded that he helped bring rain in a time of drought. These traditions testify to the unique piety of the Cypriot people, by constantly resorting to Saint Spyridon in their daily lives and events. 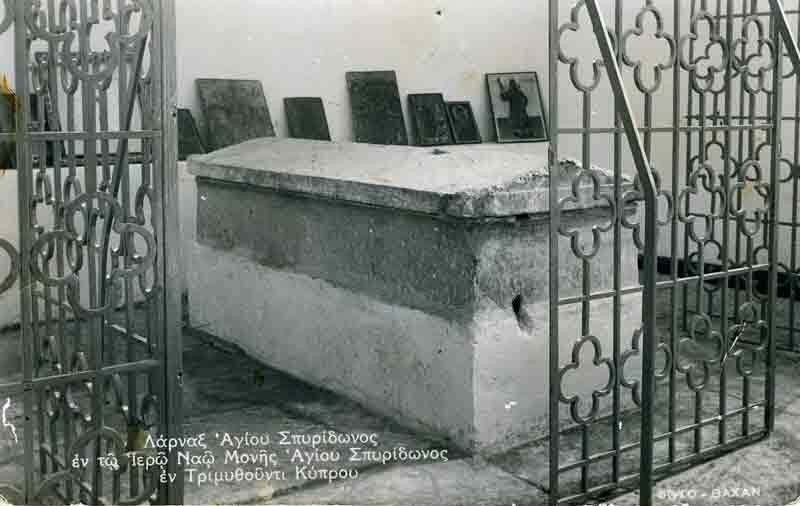 This is why there are over eighty churches dedicated to Saint Spyridon in Cyprus alone, and besides Kerkyra there are many throughout Greece and the diaspora as well, and he is the patron saint of Piraeus. In Cyprus his central shrine was his monastery in Tremetousia, which was later built around an earlier church from before the seventh century. 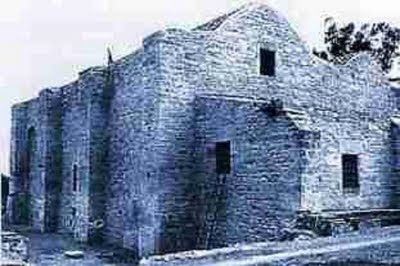 Archaeological research, conducted in 1966, informs us that the main church of the monastery was built over three earlier churches, each one succeeding the other. It seems the first dates back to the late fourth century or early fifth century and was destroyed by Arab raids, but the piety of the people kept rebuilding it every time it was destroyed. The earliest reference to the operation of the monastery is from 1735, when the Russian monk Basil Barsky reported that Archbishop Sylvester had a few years prior renovated the dilapidated church and appointed an Abbot and monks had come, who formed a brotherhood. Later, however, the monastery was dissolved, probably because of the tragic events of 1821 and the looting of religious institutions from the Turkish conquerors. The turning point in recent years has been the feature in the monastic building of a Maintenance Laboratory for icons and manuscripts in 1972, under the direction of the current Abbot of the Monastery of Chrysorrogiatissa, Archimandrite Dionysios. At that time there were gathered many icons and rare manuscripts for maintenance, the fate of which is currently unknown, since during the Turkish invasion of 1974, the region was occupied and the monastery was converted into a camp of the occupying forces, inaccessible even today, after the partial opening of roadblocks.